Welcome to Episode #34 of the Living Homegrown Podcast! This week I interview my friend Willi Galloway. Willi is the author of Grow Cook Eat: A Food Lover’s Guide to Vegetable Gardening, Including 50 Recipes Plus Harvesting Plus Storage Tips. The book came out a few years ago and it is one of my absolute favorites because it teaches you how to grow and use some of the more unusual plants and plant parts – Things like beet greens, radish pods and garlic scapes. All good stuff that many people ignore! Willi is an award-winning radio commentator and writer. She began her career at Organic Gardening Magazine where she worked her way up from an editorial intern all the way up to West Coast editor. She also has an extensive gardening and writing career which I discuss in the episode. I am so excited to chat with her on this week’s podcast about her book and the more unusual things we can eat from our vegetable gardens. PLUS: you can enter to win a copy of her book! Just scroll to the bottom of this page. The Seed Farmer – The PBS episode of Growing A Greener World TV (#521) on the importance of saving seeds and local seeds. Includes info on the Organic Seed Alliance and the Seed Saver’s Exchange. I bought an extra copy of Willi’s book Grow Cook Eat: A Food Lover’s Guide to Vegetable Gardening, Including 50 Recipes Plus Harvesting Plus Storage Tips. To enter, just answer this question in the comments section below: The giveaway is closed. You can still leave a comment. It just won’t count toward a giveaway. What is your favorite vegetable to grow or eat? Any comments after that time will not be counted toward drawing. If I do not hear from the winner within 5 days, a new winner will be picked. My favourite vegetables to grow and eat are green peas. Shelling peas takes me back to the happiest time and place of my life, sitting on the veranda with my Granny on a hot sunny afternoon, flies buzzing, leaves whispering, shelling peas… heaven. My favorite vegetable to grow us garlic. I love to grow san marzano tomatoes. Two things are a must in my garden: Sungold tomatoes and salad greens. I was enjoyed hearing Willi talk and was particularly encouraged to hear what gardening is like with a toddler. My daughter is almost 2 and I’ve had to adapt the scale of my gardening to this season of life. I don’t do as much as I’d like but I still get out there! Cucumbers! You can’t beat growing and having fresh cucumbers. My favorite veggie to grow is cherry tomatoes! My favorite thing to grow in the garden is squash, any kind. It’s so versatile and can be savory or sweet and is very prolific. You have to be on your toes! I am always amazed at the range of flavors from robust to delicate. Makes me hungry for some! I love growing beets and turnips because they are so easy in my cool climate and work in many diverse cuisines. Swiss chard is my favorite to grow! This year I would say sweet potatoes. I planted them in straw bales (my favorite way to plant my veggies) and it was such fun to tear open my bales (like Christmas) to see how many sweet potatoes were inside. They weren’t dirty and I yielded a great harvest! I grow sweet peas and pick the immature, flat pods to eat raw for dipping and in salads. I enjoy your emails and learned a lot from the Off The Grid summit! I love to grow peppers. Do i have to pick just one? Tomatoes, beans, garlic, chard and squash…ooops.. I love growing black pearl and juliet tomatoes. They are great by themselves, oven dried or pealed and soaked in pepper vodka! My favorite has always been sweet corn! Soooo yummy! I love to grow garlic because I am very successful at growing them in our cool Northwest environment, I cook with fresh garlic and the scapes, as well as pickle, jam, and dehydrate. Hi Theresa, and Thanks. IF I “Don’t win”? I WILL BUY One. One Veggie I Always grow is Beets. I Plant both reg. & Yellow beets of several different varieties. The Bulbs AND the Greens Taste different between types. brussel sprouts, who could wish for more. tossed in with carrots and a bit of bacon…..hmmmm. Being from southern Louisiana, my favorite vegetable (which is a fruit) to grow & eat is Creole Tomatoes! There is nothing else that tastes as good as food you have nurtured to being the BEST you have tasted. These are my favorite! I like carrots, mainly because I love to watch two of my kids snacking on them… rabbits can’t compete. I love trying to grow things I have never grown before. Many failures, but I consider each one as a new way not to do it. When the successes come, they come big time. Love the gardening. Green beans. I’ve grown & canned or frozen them for almost 30 years. But that’s just on of many favorites. It’s really hard to chose a favorite since I love to garden (and eat my vegetables) but I think peas are my favorite since they come early and I can start canning and get in the swing of Summer. My favorite vegetable to eat are roasted beets. My favorite to grow are tomatoes. There’s nothing better than tomatoes fresh from the garden. Hard to pick just one ~ Sungold tomatoes ~ to snitch in the garden and eat off of the vine…… no chemicals for me! also Cucumbers ~ pick and eat for faboulous flavor. and new ones last year ~ Cinnamon basil and red shiso to add to my salad greens because it gives my salads some spark! My fav vegetable to grow is green beans. When I was a kid my parents had a big garden and this one time they gave me a extra bag of green bean seeds. On the side of the garden I made a mound of dirt and planted the seeds. Before I knew it we had a big bush of beans flowing out. Now in every garden I plant I always put down green beans. We love home-grown sweet corn. It’s fun to watch it grow and delicious to eat…especially with fresh home-grown tomatoes…makes a meal! I have only grown tomatoes, but, I have a new love of Swiss chard, and want to learn the best way to grow. Hardneck garlic is probably my favorite. The tomato, because I can grow so many varieties and do so much with them. Of course, technically tomatoes aren’t a vegetable……so then, I pick peppers – because there are sweet and hot varieties, so delicious and versatile. My favorite vegetable to grow is zucchini. I love both the zucchini and the blossoms, which I stuff and fry. fav is hard but i’d have to go with tomato right now, off the vine so amazing that i cannot make myself by tomatoes at the store in winter. i savor the season when it’s here and preserve as much as possible! My favorite vegetables to grow and to eat are found in the Native American Three Sisters Garden: They are corn, beans and squash. Nothing tastes better during the summer than fresh corn on the cob grilled on an outdoor grill. Beans are great because there are so many different varieties with all the cultivars and heirloom varieties…lots to grow! What goes for beans also goes for squash. I was introduced to garlic scapes a few years ago & love them SO much it’s very nearly worth growing garlic JUST for the scapes!! So interesting to see what everyone says…great that we all have such different tastes! 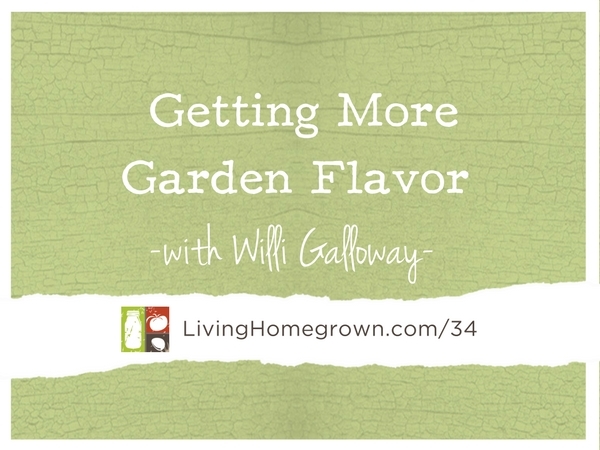 My strategy is to make sure to plant favorites whose flavor you just can’t get at the market and the ones I love but that are so expensive to buy. So, that means tying to expand my kitchen herb garden each year, lots of beets (so healthy, delicious, and pricey here), tomatoes, peppers, green beans,…wait, did you say just one?? It would be so much easier to list the veggies and fruit that I DON’T like! Theresa – I enjoy your blog, all the wonderful notes, and your style very much. Thanks!! I LOVE them all…but Purple Tomatilloesare awesome to watch grow and to cook with! I loved this podcast. I’d never heard of radish pods and some of other vegetables she mentioned. I completely agree that herbs are some of the best things to plant in the garden. I think it helps us eat healthier when we include herbs, it makes us eat fresher and herbs are great blood cleansers. Plus, it makes grocery shopping much cheaper! Thanks for the podcast! So glad you liked it Dana. My favorite vegetables are Early Girl tomato, because I can’t wait to get tomatoes as soon as possible, and Roma because I like the solid flesh and deep flavor it has. Another great podcast T Lo! This would be hard for you, but when I grow carrots I like to leave them in the soil until the soil has frozen an inch or two deep Doesn’t seem to hurt the carrots, but the flavor is great. My favorite veggie to grow is asparagus. Little care with big rewards! My favorite vegetable to grow is garlic. I love snow peas. Many get eaten right in the garden. Such a treat! I love snap peas and eggplant. Wow..it’s hard to pick just one. I love them all 🙂 Tomatoes do win though. Nothing like a tomato sandwich, especially if theres some cucumber, mayo, red onion and salt and pepper with it. I’m a beginner gardener and so far my favorite thing to grow is lettuce. Even though there is so much washing that needs to happen for lettuce, I love the crispness of a fresh lettuce leaf picked and eaten in the same day. It’s so worth it! Butternut squash grows well in my garden. I love to eat it in soups, side dishes, muffins and even pie. My favorite? It’s a new one for me – asparagus yard long beans! These beans grow and grow and grow! The grandkids thought they were great and enjoyed helping me harvest these beans. They even ate some (wahoo) and said they actually liked them! I will be growing these every year from now on. Oh, I also like to grow the bullseye beets – which I think is the same thing as the chiogga beet. Not only are they delicious, they are beautiful too! can’t wait to try the green seeds of cilantro. I have lots. I love growing garlic and I love garlic scapes! My favorite vegetable to grow and eat is Sweet 100 tomatoes! Theresa, I love your show, and it’s great that you ask us to comment on your questions. I learn so much from others here! Thanks for all you do and providing such a great resource for us. Thanks Ginny. Merry Christmas back at ya! I am so happy with growing Rainbow Swiss chard. It is beautiful & easy to grow. I’ve been adding it to many recipes & experimenting. There is nothing better then produce from your own yard especially if it’s from seed. It’s like watching your children grow in a season. I like both “Tree Collards and Broccoli”. With tree collards if you have a plant you pull a leaf cut the top half off and stick the lower half with stem in moist sand or compost and each will form another plant. Just that simple. Broccoli, pick the leaves and crowns leaving the center trunk and eat them. When the season ends instead of throwing the trunk in the compost bin, peel it back and cube it to boil as a vegetable or shred it to make slaw. Both plants are easy and fun to grow, not to mention good and nutritious to eat. I have to grow tomatoes, for eating fresh and for canning. lettuce! It’s so gratifying to see if sprout within days and to watch it respond to rain. My whole family loves it and the kids eat salads without fuss if it’s our lettuce. We enjoy growing a lot of our own food and learning new things to grow and new ways to cook them. We already grow garlic and use the scapes to make pesto, but would like to have more recipes for our vegetable garden harvest. Our family LOVES tomatoes. They are easy to grow and very delicious. After we have eaten as much as we want, we always can the rest or make salsa! I love growing tomatoes. There is something exciting about seeing the first baby tomato and watching it grow big and red. Goes back to when I was a kid and my grandparents grew tomatoes. We’d come to visit them and there would be a table by the tool shed full of yellow, orange and red beauties. Mmmm. To grow- my favorite is radishes. Fool proof! To eat – brussel sprouts, well cooked and covered with butter and salt. Yum! I’m not sure which is my favorite vegetable to grow. I also enjoy eating most of them. I guess I will pick carrots as my favorite to grow and eat. Once they start forming I like to thin them and use them in salads and they are one of the last things that come out of the garden. Plus there are now fun varieties to try. Peppers are my favorite because they come in so many different varieties of colors, shapes, flavors, and heat levels. AND they can be preserved in so many delicious ways. Just this year I have used peppers in canned salsa and pepper jelly, dehydrated to make hot pepper flakes, and I am currently fermenting a batch with a Kraut Source device to make hot sauce. You just can’t beat a garden full of peppers! So tasty as a general topping ! I would have to say tomatoes. They are so sweet straight from the garden!! My favorite vegetable to grow is arugula. It is easy to grow, especially during the cool spring and fall weather in Montana. The flavor is amazing, packing a spicy punch for such delicate-looking leaves. It is versatile in cooking, such as on its own as a salad or on top of pasta or pizza. I love the convenience of having fresh herbs growing in our yard. I am a new Gardner. Recently retired to Nevada. In California I have grown tomatoes. I love beets. The greens are delicious and the beet roots can be prepared so many ways. Ok, like so many others, tomatoes are my favorite veggie to grow. I grow only heirlooms and the taste differences between the varieties is incredible. They have spoiled me for grocery store tomatoes forever. I’m lazy, so when volunteer potatoes come in I couldn’t be happier. I barely have to tend them and then in the fall I get to dig them up and have a few modest dishes of super flavorful comfort food. I love to grow pumpkins! The excitement of seeing a tiny pumpkin on the vine is one of the best surprises. My favorite vegetable to grow is pickling cukes, as we make dill pickles for ourselves and to share with others. We also give surplus pickling cukes to others too! Actually, we love SO many vegetables and tending a large garden to grow our own food and share with others! green beans are favorites among many veggies we grow. The book sounds wonderful! Tomatoes are a must for my garden as are cucumbers green beans and tons of basil… Everything else is a plus! I love beets as of late, and the various colors and varieties! I’ve grown amaranth, and yes, it’s quite stunning ! Great podcast! I loved hearing the excitement in both voices. 🙂 Makes me excited to start a new season. Totally looking forward to trying carrot leaf pesto and green coriander seeds… they both sound yummy, especially the vodka-infused green coriander – what a great idea!! We’ve grown amaranth too and the birds love the seeds + we also enjoy harvesting garlic scapes as well.